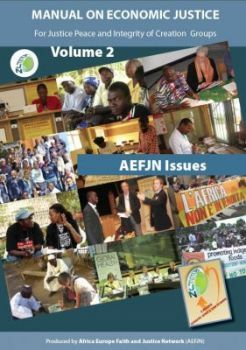 AEFJN has produced a manual for JPIC groups and other groups working on issues of economic justice. It is an excellent working tool to animate JPIC seminars. The Manual presents the underlying causes of economic injustices in Africa and it stimulates groups to work on issues relevant for Africa. The Manual consists of two Volumes. The Pastoral Circle is presented as a methodology of work in order to improve understanding of the world we live in, in particular the economic system and the ecology, and to provide a Christian answer to it. Below you can download the entire Volume 1, each of the chapters separately and the annexes.